Here you go, another competitively priced Cheap Shed for you. 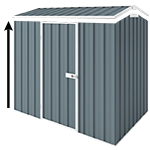 This Cheap Sheds Model is a medium shed measuring 2.45m x 2.8m. It is perfect to store your lawn mower, leaf blower, wheelbarrow, whipper-snipper, tool boxes and gardening gear. With some great organisation accessories you will have ample space for your items. FREE Masonry Anchors - to secure your shed to the slab or foundation. Important for your safety and to keep the shed grounded. FREESkylight Sheet (valued at $79) - a Skylight Sheet allows natural light into the shed making it easier to navigate your stored items. Please note, the skylight replaces a roof panel accordingly. Needed a basic garden shed for the backyard. Super happy with this one. Bought online and product turned up well packed and within stated shipping time. Best communication I've ever had with an online seller. A few small issues here and there, but considering the shed is 30-50% cheaper than competitors it's definitely worth it. Instructions were at times a little difficult to follow. Definitely a 2 person job (3 would make it easier) so don't start setting up without a mate. Towards the end, a few pieces weren't quite lining up and had to have new holes drilled. Door assembly also potentially had the wrong piece or instructions so had to bend the metal slightly to make it fit but no dramas. Screws for the door protrude into the door jam which means it takes a bit of force to close the door, but again no big issue. The main roof beam twisted a small amount whilst we were trying to put it together, but a few extra screws seem to have solved the issue. All parts were included and everything is well labelled. Plenty of natural light gets in with the sunroof on the opposite side to the door. We didn't put a slab down for a foundations: instead we've got some 300mmx300mm pavers in each corner, with the shed dyna-bolted onto them: feels solid and hasn't swayed in the wind yet. I am very happy with the shed. It arrived just as expected with great communication along the way. The assembly was really quite easy, a couple of queries in the written instruction but the video solved that straight away. I would like to see a support through the middle of the shed sheeting so the screws have a little more to bite into, but the structure of the shed is really very sturdy. Package (85kg) pretty heavy, would be better if it came in x2 43kg boxes. Took a while to set up, have to put all the panels together. Looks good once set up. Pretty thin walls, don't know how secure it's going to be. Affordable compared to others on the market. The only problem I had is that I invited too many blokes over to install it - chaos!! Hi, this is similar to the Spanbilt Yardsaver G78 in size and quality except that this comes with the free skylight unlike the regular on. This isexclusively manufactured by Spanbilt for our line. I hope this helps and please let us know if you have any questions. Thank you.